Working with weights to strengthen the chest. Breasts are made up of all fat, the bigger they are and more fat there. But behind the fat mass, there are 2 more or less developed muscles in women (often less than elsewhere) and we can beef them up, strengthen them so that they retain better breast and avoid him to relax. Most of the women have ideas received to beef up the chest. Some believe that strength decreases the size of the breasts as the muscle pump grease. Others do not want to look like a man and say that it is not for them without thinking it’s a good method to strengthen them in a healthy and natural way. Please note that to beef up the chest, is not an easy job. And depending on your age, this can even very complicated to have muscle volume to his chest. But we can still find a happy medium. Between the bodybuilder who works excessively and has more breasts (Finally, if she but they need, most of the girls who do competitions have the breasts redone) and one training muscle normal, there is quite a difference. Besides, if you think that you will become hyper muscled pectorals doing a classic training, you’re wrong! It is almost impossible. So, you can your muscles without looking like your guy, and you get highest breasts, less falling with these muscle to do at home or classroom exercises. If you can afford a gym, it’s frankly better because you will work your body evenly and your body will be better. But if you don’t have the means, then you can start with these physical exercises that will enhance your tone. The upper body, is not only the breasts. There are the shoulders, back, arms, abdominals, so… and that’s a lot of muscles to work. Fortunately, there are physical exercises that allow to work many muscles at the same time to firm up breasts. Lying on the bench and on the back, legs raised at an angle. You can do these series 2 times a week. Initially, you will put no weight, the bar will be empty but she already weighs 10 to 12 kilos which is not bad when one never practiced. But you will eventually need to increase the load. And Yes, it takes force to grow muscle. If you push effortlessly, practically, the muscles do not work, and you breasts that keep their shape, no more. In fact, made the home test with pumps. Pumps, is somewhat the inverse of the bench because you’re lying on the stomach and on the ground. Your hands flat next door at the height of shoulders, you push back by keeping your back straight. not easy huh! As you stay straight, the back flat, you’re obligated to contract the ABS. Pushing, these are the pectorals and triceps forcing most. A variant for beginners, is to make the pumps in support on the knees and not on the balls of the feet. It reduces the load of about half made a try. As for the bench to do large series to have the result. The problems with the pumps, it is difficult to make 10 or 15. We love before. If you get to make series of 6, hats off! This is a very good exercise to tighten breasts. You can do it at home, with small weights, water bottles or big books. Keep the arm bend and back by tightening and blowing. The number series and rehearsals and always based on the model of the bench. Less difficult and you can do it anywhere, it is an exercise within the reach of all women who want to beef up the chest, tighten and firm breasts. You should be able to do the long sets, 15 repetitions without problems. 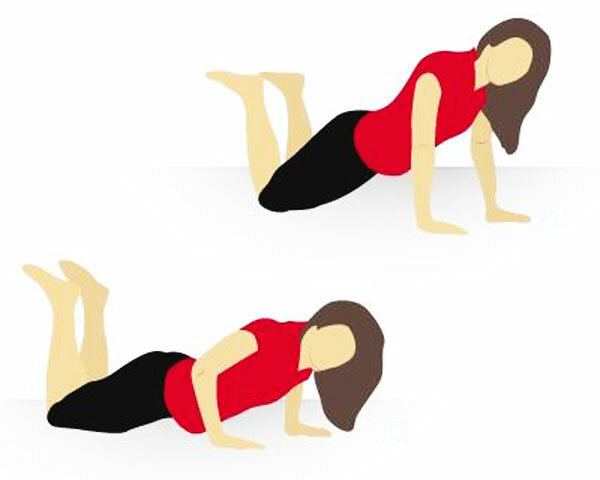 Necessarily it is less effective than the 2 exercises above, but it allows to firm up breasts and this isn’t really tiring.